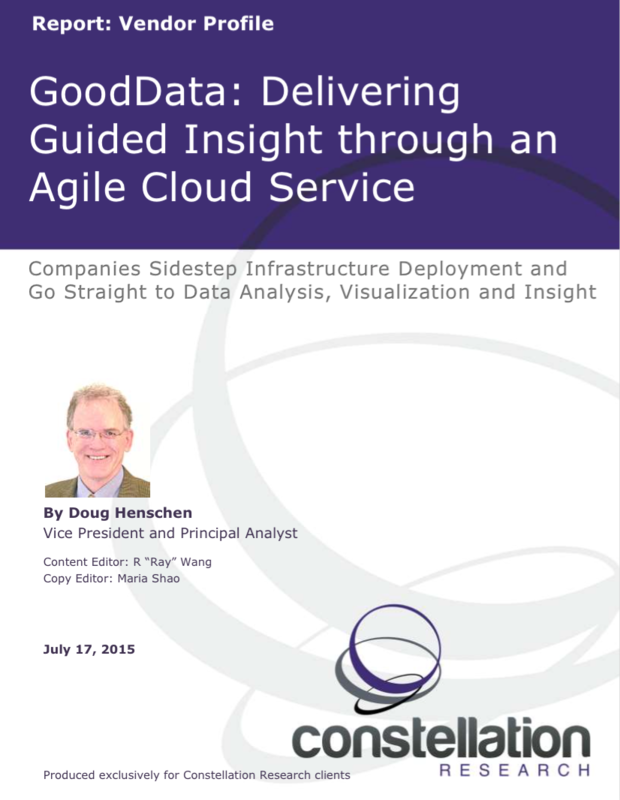 GoodData: Delivering Guided Insight through an Agile Cloud Service | Constellation Research Inc. The center of gravity for data is shifting to the cloud, and so, too, is interest in cloud-based data analysis. GoodData describes its cloud-based platform as delivering “guided analytics,” but it is best described as a business intelligence platform including everything from data integration, warehousing and exploration to ad hoc analysis, reporting and visualization with growing analytical capabilities. Core uses include development and delivery of interactive metrics dashboards and reports with support for ad hoc data exploration, visualization and analysis. GoodData also supports advanced analytical capabilities, including trending and forecasting as well as statistical and regression analysis. This vendor profile provides an overview of GoodData and identifies key differentiators, product offerings, and a short list guide for buyers.